Excel has long included the ability to merge adjacent cells into a larger, single cell. This ability has been used by many worksheet designers to give their worksheets a polished, professional look. It is better to unmerge the cells in the first column, but then you may wonder how to make the records sort properly in the worksheet; how to keep the row pairs together during a sort. You can do this by putting your project name in the first row and the project name appended with “zz” in the second row. For instance, if the first row contains “Wilburn Chemical” (the project name), then the second row could contain “Wilburn Chemicalzz”. Format the second row’s cell so the name doesn’t show up (such as white text on a white background), and you can then successfully sort as you want to. 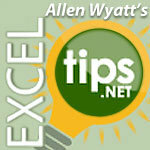 Excel Tips Microsoft Excel, Microsoft Excel Tips. permalink.